After the Global Voices Summit in 2008, I came home and raved to friends and coworkers about Ushahidi, and they looked at me and said, “Usha-what?” Now people are coming up to me in the hallways and asking me if I’ve heard of this new Chile crisis mapping project that’s happening at SIPA. Eight days ago I found out that I would be attending the 2010 Global Voices Citizen Media Summit in Santiago, Chile. I’m thrilled to have the opportunity to meet up with the larger GV community again, and I’ve been browsing through old blog posts from the 2008 summit in Budapest. I helped put out the liveblog for that summit, including the coverage of a session called When the World Listens, about the power of citizen media. Juliana Rotich, Program Director for Ushahidi, spoke during the session about the organization’s role in documenting the post-election violence in Kenya in late 2007 and early 2008. At the time, the founders of Ushahidi were deciding what to do now that the Kenyan crisis had ebbed. Juliana said the next step would be to create a downloadable tool that could be used by anyone in the world. Flash forward to this Saturday, when I worked with the rest of The Morningside Post team to host a conference on Policy Making in the Digital Age at the Columbia University School of International and Public Affairs (SIPA). Patrick Meier, SIPA alum and Director of Crisis Mapping and Strategic Partnerships at Ushahidi, came and spoke about “Usha-Haiti,” the instance of Ushahidi developed to respond to the massive earthquake in Haiti in January. 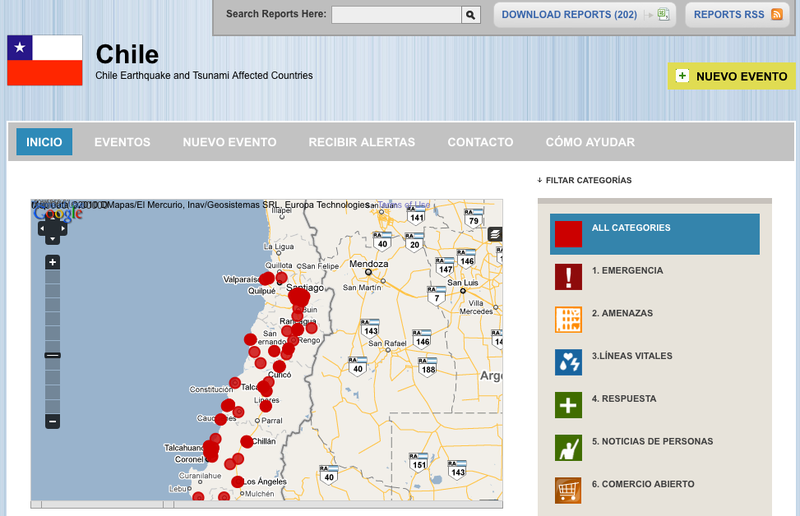 As Patrick writes on the Ushahidi blog, at 7:00am — just a few hours before he spoke at SIPA — he heard that an earthquake of even higher magnitude had just hit Chile. Before leaving for New York, Patrick had already launched the Ushahidi team into action, cloning the earthquake-specific Haiti site and beginning to customize it for Chile. While speaking at SIPA, Patrick described the Ushahidi Situation Room at Tufts, where student volunteers have been working around the clock to map reports from Haiti. By the time Patrick left Columbia’s campus on Saturday afternoon, a group of students who had attended the conference had already created a Facebook group and begun organizing potential volunteers through a Google group. Yesterday, Patrick announced that SIPA would be taking the lead Ushahidi – Chile. New York now has its very own Ushahidi Situation Room, and I’m headed to campus in a few hours for a training so I can help out. I’m trying to figure out how to describe this circle of events. “It’s a small world” doesn’t seem to apply, since it is, in fact, a very big world — from Budapest to Port-au-Prince to New York to Santiago covers a lot of area, and I haven’t even mentioned how some of the students heading the SIPA Sit Room are also putting together an instance of Ushahidi for Iraq. I’m amazed at how much has happened in this field in two years. 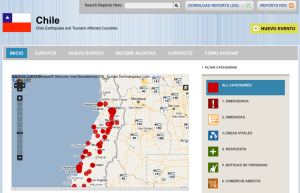 After the Global Voices Summit in 2008, I came home and raved to friends and coworkers about Ushahidi, and they looked at me and said, “Usha-what?” Now people are coming up to me in the hallways and asking me if I’ve heard of this new Chile crisis mapping project that’s happening at SIPA. My heart goes out to those who have lost loved ones in both Haiti and Chile, and I hope that what the SIPA Sit Room does over the coming days and weeks can help.